You know….growing up, the biggest thing that my parents tried to drive into my skull was that cleaning your room should be a pretty high priority in your adolescent life. I often wondered as a child why I always had to keep my room clean or make sure that it was always picked up and ready for inspection after I got done. I don’t think I ever figured it out. I guess I just thought it had something to do with responsibility! 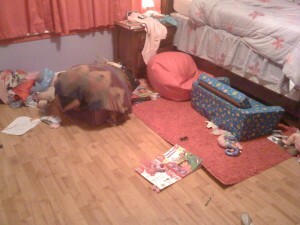 We now know why …….the REAL reason why you should always make sure that your child’s room is cleaned up. Not just because it teaches them organizational skills, not because it gives them a since of responsibility….no…. It’s for when they get sick and throw up all over the floor! If they maintain their room the floor will be clean, spotless and free of toys, books, blankets, and clothes for when they decide to redecorate the room with their sick! You will not have to wash Barbie’s hair out or wipe every intricate part of a toy light-saber. You know and they know that a whole lot of time and toys will be saved by them cleaning their room. That is exactly what happened to us last week! How funny (not really, but sort of…)–hope you got Barbie’s hair all clean!